Valhalla's KENNEDY LABSHERE hits a double for the game-winning walk-off RBI. ALLIED GARDENS (3-5-16) — In a battle of two of the top programs in the county, Patrick Henry hosted West Hills in a non-league tilt and was able to gain the victory 9-3, Friday (Mar.4). The Wolf Pack looked to get going in the first inning but SIERRA SCHLICTING who had reached base on a single was caught stealing and KENDALL MARINESI (2-4, R, RBI) was thrown out at the plate trying to score from second. Patrick Henry was able to get to Wolf Pack hurler RYLEIGH DOBYNS as leadoff hitter HANNAH McEWEN (1-3, 2 R, 3B, BB) walked and moved to second on a passed ball, CASSIE VAN TIL (3-3, R) singled and CRISTIONA CACCAMISE (1-4, R, 2 RBI, 2B) ripped a two run double to give the Patriots the 2-0 lead, next came up DANI ROMERO (3-3, R, 2 RBI, HR) who boomed an 0-1 pitch over the wall to extend the lead to 4-0. ANYA VANDERSIP (1-3, 2 R) drew a walk and advanced from first to third via a couple of illegal pitches, she and SAVANNAH CHAPMAN (1-2, R) would both score to round out the scoring 6-0 after the first inning. Many in the stands were shocked at what had occurred in the bottom half of the first inning but it was still early. However, Patriots pitcher MADISON JAMES (1-3, R, RBI, HR) had other ideas as she was able to retire the Wolf Pack in order. She would do the same in the top of the third inning as well. Patrick Henry extended its lead to 7-0 thanks to James helping her own cause as she blasted a solo shot over the right center field fence. The Wolf Pack would finally get on the board in the top of the sixth as Schlicting drew a one out walk, Marinesi moved Schlicting to third with a base hit and she scored on a hit by PAIGE BOWLER (1-4, RBI) to make it 9-1. The Pack tacked on a couple more runs in the top of the seventh inning as BROOKE SNYDER (RUN) and MOANA PISIA (1-2, R) would score to round things out. Unfortunately it just wasn’t Dobyn’s day as she went six innings, gave up 9 runs of which 8 were earned on 15 hits and walked three in the loss. Her counterpart James went the distance for the victory, in which she tossed 7 innings, gave up 8 hits, 3 runs of which 2 were earned, walked 3 and struck out 2. It won’t be the only time these two teams will clash as they will meet again Tuesday (Mar. 8) in the Kit Carson Tournament and possibly meet in the playoffs as both teams will vie for the Open Division in the playoffs. RACHEL SHELSTROM, of Valhalla, scores the game’s only run Friday. VALHALLA 1, BRAWLEY 0 – In a non-league contest that was filled with drama and suspense, the host Valhalla Norsemen gained a slice of revenge in their 1-0 victory over the visiting Brawley Wildcats in non-league action, Friday (Mar. 4) in 6 innings. The last time these two teams met was last year in the San Diego CIF Division II playoffs in which the Wildcats eliminated the Norsemen 9-7. Both teams went back and forth and it wouldn’t be until the bottom of the sixth that the drama aspect kicked in. Taking the circle for the Norsemen was the workhorse, LILY METSCH who went the distance while giving up no runs on 3 hits and struck out 3 batters while walking 2. Other notable offensive stars for Valhalla were VICTORIA VILLEGAS (1-2), and BRANDI KOHL (1-3). CHRISTIAN 21, SANTA FE CHRISTIAN 7 – In a game that resembled more of a football game the Christian Patriots traveled to Madison to take on the Warhawks in the Madison Lady Warhawk Tournament and won going away 21-7. Starting the scoring fest for the Patriots in the top of the first inning, SILENT RAIN ESPINOZA (2-2, 4 R, 3BB) singled, ASHLEY CARTER (1-1, 2 R, 2BB) walked, Espinoza moved to second, both would move up on a wild pitch. ANNA SHERBURNE (1-2, 3 R, 2B) got an RBI as she would be hit by a pitch, and SHANNON McMAHON (2-3, R, 2B) rifled a double to make the score 4-0. The Patriots would score five times in the second inning without the benefit of a hit to make the score 9-0. They tacked on 5 more runs in the 3rd inning and broke open the scoring in the 5th inning as they would plate 7 more runs to round out their scoring as they took advantage of the opportunities afforded them in the inning as they batted around while sending nine batters to the plate. In the circle for the Patriots was MALLORY STEELE who tossed 4 innings, scattered 6 hits, 7 runs of which 3 were earned, striking out 2 while walking 2 in the victory. She would be relieved by Ashley Carter who tossed an inning and struck out one batter. SERRA 12, CENTRAL 1 – The Conquistadors of Serra High traveled down to the desert to take on Central in the Monte Vista Classic and knocked out the Spartans 12-1, Friday (Mar.4). Things were really good for the Conquistadors as they scored twice thanks to a fielder’s choice and an RBI single by SELA FALLON (2-3, 2 RBI) to lead 2-0. They tacked on another run in the second inning thanks to an RBI single by VIVIAN TOMOVICH and another run in the fourth to push the score to 4-0. 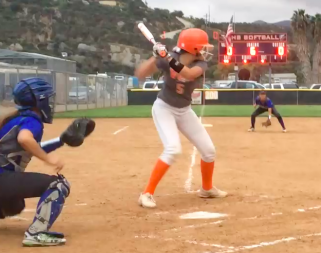 Serra tacked on four more runs in the sixth inning which included a rifled 2-run double by BRIANNA CORONADO (1-3, 2 RBI, 2R) that scored both AMBER WOZNIAK (1-3, RBI, R) and DARBY TIBBETTS (1-2, 2R). Offensively the Conquistadors pounded out 12 hits in their cause. In the circle was MEGAN POOLE who went the full seven innings, allowed one earned run on 7 hits, 2 BB and 2 K in the victory. EL CAPITAN 4, ESCONDIDO CHARTER 1 – Things were looking good for the El Capitan Vaqueros in their Monte Vista Classic matchup with Escondido Charter but a late rally led to a 4-1 loss on Friday (Mar. 4). The Vaqueros took the early 1-0 lead in the bottom of the second inning on a long triple by BAILY OLAVESON and would score when SAVANNAH MINSHEW reached on an error. Escondido Charter rallied in the sixth inning as they pushed across two runs to take a 2-1 lead and would go on to score two more in the top of the seventh. MONTE VISTA 21, GOMPERS PREP 0 – The Monarchs took on Gompers Prep in Monte Vista Classic action Friday (Mar. 4) and won easily 21-0. Monte Vista never looked back after the first inning and only allowed one hit on the day in the victory. GENNA HENDERSON led the Monarch offense with 7 RBI while going 3-4, scoring 2 R and belted a homerun. TORREY PINES 6, GROSSMONT 2 – In Falcon Fiesta action, the Foothillers of Grossmont traveled to Torrey Pines to take on the Falcons and unfortunately couldn’t take advantage of the opportunities in the 6-2 loss, Friday (Mar 4). The Falcons took advantage of their opportunities as they were able to push across six runs which would stick until the top of the seventh inning. 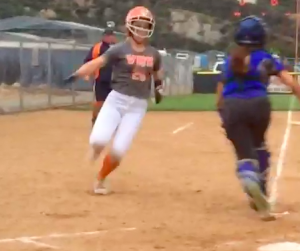 Grossmont would finally get on the board and avoid the shutout as MADDIE LINDSEY belted a 2-run homerun but that was all they could muster.